I have already shared Exclusive Guide To Start Blog Email Marketing In 10 Minutes. A successful email marketing strategy bring huge success to a business. If you are a blogger, webmaster or Internet marketer and you want to get success in your online business, then you should start building email list from very first day. A big email subscriber list not only help you get more traffic but also help you to generate more revenue. The more email subscribers you have the more chances you have to make money from affiliate sales. 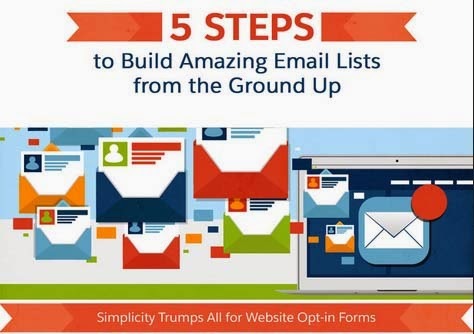 This infographic shows the 5 Steps to Build Amazing Email Lists from the Ground Up. Follow them and you are surely going to make a big email list which will help you generate more revenue and gain more traffic. If you have any question or suggestion, feel free to share via comments. Don`t forget to like us on facebook and subscribe our newsletter to get free updates.